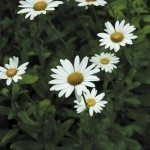 How much sunlight should a Shasta Daisy receive? They like at least 5 hours of full sun a day. Less than this, they can survive, but you will see fewer blossoms.